Phew! What a trip that was. While many of you may have spent the weekend winding down from last week and prepping for this coming week (how is it already Tuesday? ), I just got home Sunday from 2 sets of 10-hour car rides and a full week of skiing. I would be lying if I said I’m not drained, both physically and mentally! But this kinda drained is different. Just like this trip was very different than any trip I’ve had in years. If you’ve checked out my other blog posts and/or have read my story, you know I was diagnosed with a restrictive eating disorder at age 12. For years, I was trapped by the demon in my head, constantly telling me what to eat, what not to eat, to move, to do certain things x amount of times…I thought I was in control, while actually, I was being controlled. In these 6 years of ‘being sick’ I did lots of damage to my body. Not only did I lose weight, but my organs were eating themselves and even my bones were deteriorating. Not to mention the emotional panic I would feel at even the slightest change in plans. Obviously, driving to a foreign country for a week was not something I could very easily do, nor was the physical impact of skiing on my fragile body. So every February for the last 3 years, my mom and sisters would drive to Austria for their yearly skiing trip…without me. It broke my heart, but deep down I knew that it would be a recipe for disaster if I came along. Like I mentioned earlier, this year was different. After choosing recovery two years ago and declaring independence from my eating disorder, I was finally strong and HEALTHY enough to come along on this epic and BEAUTIFUL vacation! Having heard stories from my family about their past ski trips in Austria, as well as simply just imagining what food is like in the middle of the Alps, I knew I would have to prepare myself food-wise. Along with my breakfast staples (as we were staying in an apartment where we had to arrange our own breakfast) and snacks (duh! ), I brought ingredients that would make it possible to make nourishing plant-based lunches and dinners. Aside from the physical preparation, there was also a lot of mental preparation that had to be done! I am someone who thrives off of routine and planning, whether it be waking up and going to bed at a certain time, the activities I choose to fill my day with, and of course, the food! Inevitably I would be eating out on the trip to the mountain as well as on the mountain itself, and chances were high that vegan options would be limited. My main goal is to always eat as many whole, plant-based foods as possible, but if it comes down to eating cheese or not at all, of course I would opt for the cheese. This too, was an aspect of the trip that was a big hurdle. I am a very energetic person that can’t sit still for long periods of time, so 10 hours in the car was going to be quite a challenge, to say the least! We left the house on Friday around 4pm. Kinda tricky considering it was close to rush hour, but we had lots of luck and barely had any traffic! The goal was to drive for 5 hours, stay at a hotel in Germany, and drive another 5 hours on Saturday. Around 6:30pm, we decided we wanted some dinner and so we took the nearest exit. My sisters wanted McDonald’s, so my mom agreed with that. As much as I wanted to ‘be part of the family’ and ‘go along with it’, I set my boundaries and told my family I couldn’t eat there. McDonald’s is such a large fast food chain that does so much harm to animals, I just refuse to support a business like that! So after they finished up their cheeseburgers and nuggets and fries, we kept driving until there was another exit with a different restaurant. It was around 7:30pm by now, so I knew I would have to be flexible and just have to settle for something even if it wasn’t ideal. Around 7:45pm, we stopped at a gas station with a Coffee Fellows coffee shop and buffet. The only options at the buffet had meat in them, which honestly surprised me a lot. They didn’t even have a vegetarian option! So I checked out what they had at the Coffee Fellows in terms of food: sandwiches and bagels. Even though it was dinner time and I would have preferred an actual meal, I was grateful enough that they had a vegan option! I got an avocado + hummus bagel, and it was surprisingly very good! 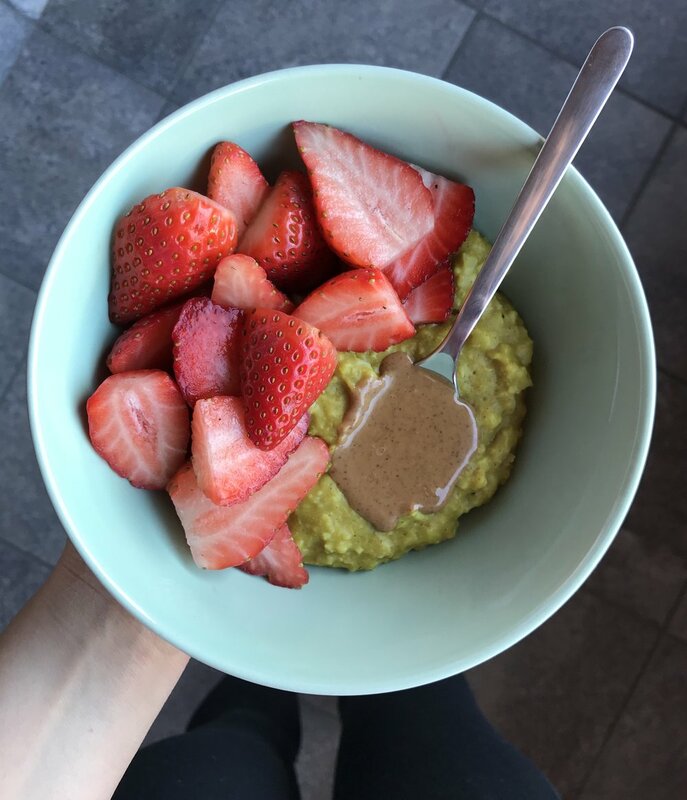 In the bowl: rolled oats, cauliflower rice, almond milk, and vanilla protein powder microwaved for 2minutes and topped with sliced strawberries and almond butter. In the mug: coffee from the hotel that I added my own almond milk + grass-fed collagen peptides to. After breakfast, we loaded the car back up and were on our way around 10am. We took a pee stop around 12pm, and ended up stopping for lunch at a gas station around 1pm. Every gas station seemed to be the same, because they ALL either had a McDonald’s + Coffee Fellows or the earlier mentioned buffet + Coffee Fellows. So avocado hummus bagel it was, again! After lunch I snacked on fruit and bars in the car, and we finally stopped for dinner at this über fancy hotel which was an hour away from our final destination in Austria. They didn’t have any vegan options, but the waiter was kind enough to listen to my explanation and arranged for the kitchen to prepare pasta with olive oil + veggies. The portion was not very large, so I ate some bread with olive oil on the side as well as my mom’s fries. Again, not the ideal ‘healthy’ meal, but I knew that I would have to be flexible in these kinda scenarios! We FINALLY arrived at our apartment in the mountains on Saturday night around 9:30pm. You’re probably thinking how it got this late…yeah, traffic hit HARD around 2pm that day! But hey, at least we made it! As soon as we arrived, we of course immedaitely went to go check out the apartment! I was surprised at how small it was compared to the photos. The kitchen was also extremely small (dangit!) but they had all the amenities we needed, even an oven! We unloaded the car and were finally settled in around 10pm. I made some snack and was off to bed, because I was tired as heck! The next morning, I finally got a chance to see the beautiful view from our apartment! I took this below picture from the balcony, the same place where I took all my breakfast pics ;). After breakfast on Sunday morning, we were headed out to our first day of skiing! 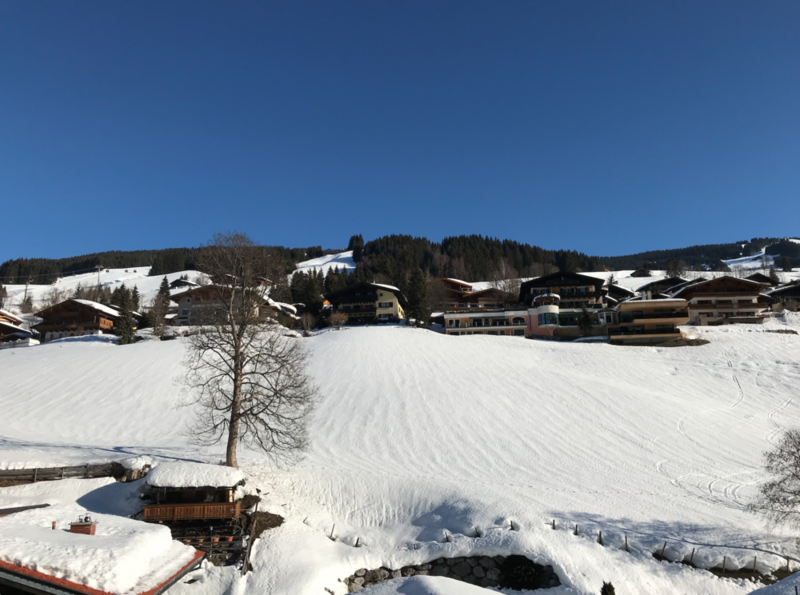 We drove about 5 minutes to the little village of Saalbach, where you will find lots of small restaurants, ski shops, souvenir shops, and two ski lifts that will take you to the top of the mountain. Before we could get in the ski lift, we had to stop by one of the ski shops to rent skis. Luckily, my mom had arranged everything online beforehand, so we were in and out of the rent shop within 20 minutes! Points for you, mom :) Then we got in the ski lift and up we went! When I got to the top of the mountain, I suddenly felt this wave of fear. I hadn’t been on a skiing since we went to Sunday River as a family in the U.S. on some kiddie slopes. Now, I was at a 2000m elevation in the middle of the fricking ALPS. But then I reminded myself of how far I have come. I fought my eating disorder for years to be able to do these kinda things again. I fought to be able to come along on vacation, to try new things, to face my fears! So I told myself to go slow, and I made it to the bottom of the mountain! Of course, my skiing skills were a little rusty in the beginning, but I quickly picked it up and was totally in my element a couple days later! The whole week, my mom, my sisters, and I went out to eat lunch in cafés and restaurants on the mountain. That was the most practical and logical thing to do. However, day 1 was already a hard hit of reality. When we sat down to the menu of our first mountain restaurant, I was bombarded with fast-food type dishes such as Wiener schnitzel, spaghetti bolognese, burgers, and fries. There was literally nothing on the menu that even mentioned anything close to a vegetable! I told the waiter I was plant-based and said I’d have spaghetti with plain tomato sauce, until all of the sudden she told me they had a plant-based burger! I was super excited, as I was not aware of this. Obviously I ordered that, but was a bit frustrated when the order came. It was indeed a veggie burger, but it was piled high with mayonaise and real cheese. I was starving as it was almost 2:30pm, so I decided I wasn’t going to make a fuss and just ate the burger. What I was afraid would happen, did. I felt super nauseous and bloated the whole afternoon, which made the skiing less pleasurable. I kept reminding myself that it was just one meal, and that I really just had to keep my flexible mindset switched ON. So, the next day, I tried it again. We sat down at a restaurant on a different mountain this time. It was beautiful weather, so we sat outside in the sun. This restaurant did have vegetarian options (all using cheese), so I hoped that I could ask for a dish without the cheese. I asked if they could make the squash risotto without cheese, but the waiter said that was impossible. Then I asked for the creamed spinach + rice without the cream, but that too, was impossible. Lastly, I even asked if they could make me a pizza without cheese, but even this was claimed to be impossible. I was getting quite upset at the hostility around here. I still had to eat, though, so I ended up getting the squash risotto. It tasted good, but after a few bites I already knew this excessive amount of cheese was going to give me stomach issues. I finished my plate though, because I really needed the energy and wasn’t going to ski on a half-empty stomach for the rest of the day. Surely enough, I had to throw up more than 5 times after lunch. The whole afternoon I felt so incredibly sick, I even had to stop skiing earlier because the nausea was too horrible. It was right then and there that I decided this whole ‘out to lunch’ thing wasn’t going to work out. After skiing that day, I went to the nearby supermarket and bought loads of groceries so that I could pack my own lunches to eat on the mountain for the remainder of the week. This worked out really well and spared me LOTS of discomfort the rest of the week! The trip started out really tough. It was hard finding foods that fit into my diet, and many of the people at restaurants either misunderstood or were quite hostile when it came to accommodating my needs. I went into this trip with a flexible mindset, however, which definitely helped me learn from these experiences and figure out what would work for me! Another part of this trip that I haven’t mentioned above but is really important to me, is the relationship dynamics between my mom and my sisters. Being confined in such a small apartment and just literally being together the WHOLE DAY, allowed us to really get to know each other better. Overall, I think the week went very well recovery-wise. I did what I needed to do and did not restrict myself, even in situations that made me feel uncomfortable. There was, however, A LOT of stress from my end, making this vacation one where I didn’t necessarily come home from feeling ‘relaxed’. Honestly, I much rather stay home or take a city trip than do the whole 12-hour-drive-ski-all-week kinda thing. I don’t have regrets for coming along on this trip though. I’m honestly really proud that I faced the challenge of being away from home as well as all my routines that go with that! I’m viewing the whole experience as a learning experience, because it taught me not only how to advocate for myself and bond with my family, but it also made me better realize what kind of person I am and what my preferences are!